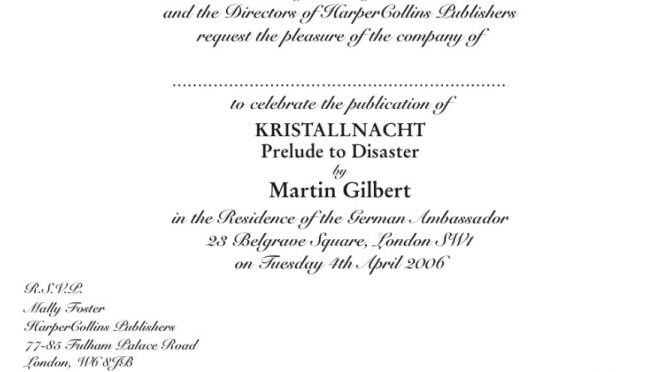 In 2006, when Martin’s book Kristallnacht came out, he was invited to a party to celebrate the book and to launch it on its way. The party was held at the Residence of the German Ambassador in London, and our host was the German Chargé d’Affaires, Hans-Henning Blomeyer-Bartenstein. Martin brought eight large maps from the book that showed the towns and villages in Germany whose synagogues had been destroyed during Kristallnacht, on the 9th and 10th November 1938, so people could see not only the places that had been affected by Kristallnacht but how Jewish communities were an integral part of the German landscape. He spoke about what had happened and described some of the events in the book. He signed books for those who were interested. To me it was one of the most moving events I had ever attended. For the first time I felt it really was a different century. Imagine coming to the Residence of the German Ambassador in London and leaving with a copy of Sir Martin’s Kristallnacht! It gave me a sense that we can look back together at a tyrannical brutal period of time and learn from History, that actions do not need to be repeated, that we can change and grow and celebrate our differences and the common humanity that we share. There is a German word ‘überleben’ which means ‘survive’. It is the same word in Yiddish, the mother tongue of many Jews living in Europe before the war. In that evening at the German Ambassador’s Residence, we had all überlebt, we had survived. Previous Post“Kristallnacht taught several lessons”Next PostHow to spell Hanukah?